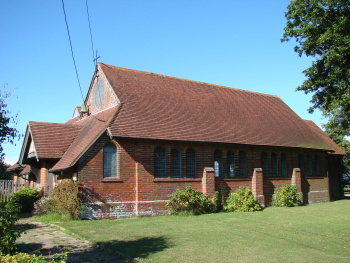 A mission church and parish room in the parish of Ewhurst Green was planned here in 1894 and opened the following year and it remains within that parish. The architect was G E S Streatfeild (CDG 6 p99). 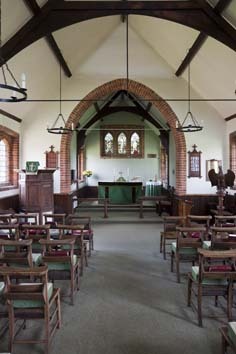 Costing £800, it consists of an aisleless nave and chancel without a tower or belfry, but with a west extension which incorporates the porch. The material is brick and the vaguely Tudor detail includes side-windows grouped in threes; the east window is similar. The roof inside has arch-braces. Font: Presented from Rye Harbour church on the twentieth anniversary of the church, i e c1914 (BE(E) p628). As Nicholas Antram comments, it has little that is Teulonesque about it, unlike the font there today. 1. 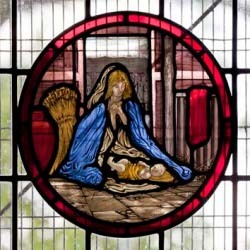 (East window) Shrigley and Hunt, 1924 (www.stainedglassrecords.org retrieved on 28/4/2013). 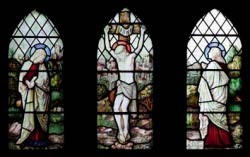 The scene of the Crucifixion extends over all three lights of the window. 2. 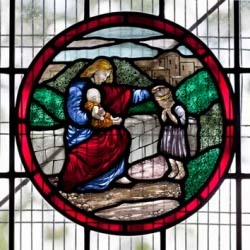 (South nave windows) I Pocklington, 1995 (Information from Nick Wiseman). Pulpit: Assembled from panels that look C18. Their origin is not known.